This page provides best estimates, at the time of the Call for Proposals, of instrument availability and target (RA, dec) restrictions for 2017B. At each Gemini telescope, instruments are mounted at the Cassegrain focus on the instrument support structure (ISS). A science fold mirror mounted inside the ISS can be rotated to send the light from the telescope to any of four side-looking ports, or can be retracted so that the light goes to the up-looking port. At each site, the calibration unit and the Adaptive Optics system use two of the side ports, leaving two side-looking and one up-looking port for other instrumentation. As more than three instruments are offered each semester, instrument swaps will be required and not all instruments will be available for the entire semester. Instrument swaps will be driven by demand and scheduled to minimize impact on the queue. Certain targets or entire programs may not be feasible once the final schedule is determined, at ITAC or thereafter. If an instrument is requested for less than 6% of the Bands 1+2 time, the Observatory reserves the right to limit the RA range available to programs, or to not schedule the instrument. Changes to the instrument mounting are not permitted during classical runs. Non-sidereal targets can have a broader range in RA than indicated in the Tables below due to, for example, the need to observe comets relatively close to the Sun. The ephemeris for any submitted target however must include a position that is accessible between evening and morning twilight at some point in the semester. For rapidly moving targets PIs should specify in the proposal when the target is accessible, and the coordinates of the target at that time, so that the observation can be checked for feasibility. Gemini Observatory attempts to schedule all time-critical observations whenever possible within the constraints imposed by instrument availability, instrument configuration, weather, and science ranking band. Additionally, nights not scheduled for multi-instrument queue including classical and other observing modes, fast-turnaround blocks, shutdowns, commissioning, etc., impose additional constraints on time-critical programs. Short observations (~1 hour) can often be accommodated during fast-turnaround and priority observing periods. Programs with time-critical observations are encouraged to include detailed scheduling constraints with their proposal, such that they can be considered along with other constraints when developing the telescope schedule each semester. DSSI Speckle Camera will be available, subject to demand, in the first half of 2017B semester; targets are therefore limited to RA 19h to 6h. The Laser Guide Star (LGS) system will not be available for regular programs in 2017B. POLISH-2, the high-precision visitor polarimeter, will be available, subject to demand. PIs interested in obtaining data in the 2017B semester with this instrument, must contact the PI (Sloane Wiktorowicz - sloane.j.wiktorowicz at aero.org), as all proposals for this instrument must be in collaboration. **Due to limited sky availability during the semester, GMOS MOS programs requiring pre-imaging should not have targets in this region, and other programs with targets in this region should not require a large amount of time, or have strict timing or observing constraints. Observations using GeMS are restricted to greater than 45 degrees elevation. How this translates into RA and dec restrictions is indicated in the Table. A engineering shutdown is scheduled for 10 nights in October (October 3 to 13 2017), reducing the availability of observing time available in the RA 19h to 5h range by 17%. Due to greater-than-average, repeatable, weather loss in August and September at Gemini South, the availability of time in the RA 18h - 20h range has been reduced by 15%, RA 21h - 23h by 8%, and RA 0h - 2h by 6%. DSSI Speckle Camera will be available, subject to demand, in the second half of 2017B semester; targets are therefore limited to RA 23h to 12h. Phoenix will be available, subject to demand, in 2017B semester. Targets are limited to RA defined by non-LGS instruments. 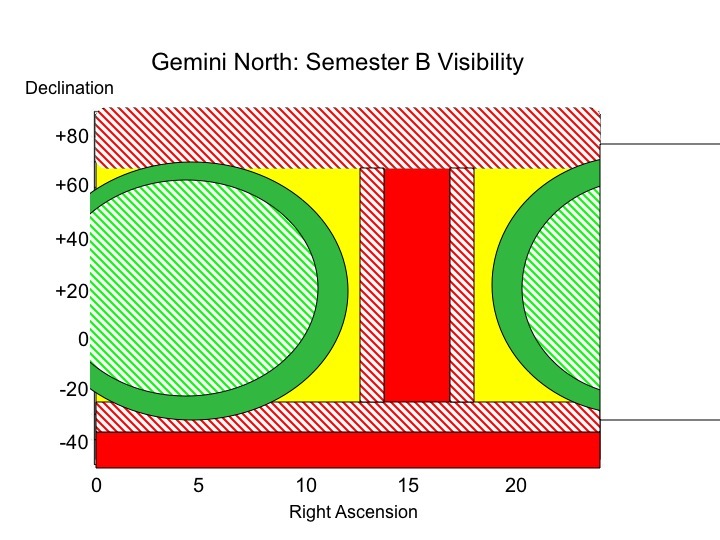 Figure 1: Schematic representation of target accessibility at Gemini North during semester 2017B. Green regions offer unrestricted access, red regions are inaccessible. Hatched areas indicate the more restricted LGS regions. The yellow region is possible, but restricted. See text, and values in the Gemini North Table above. 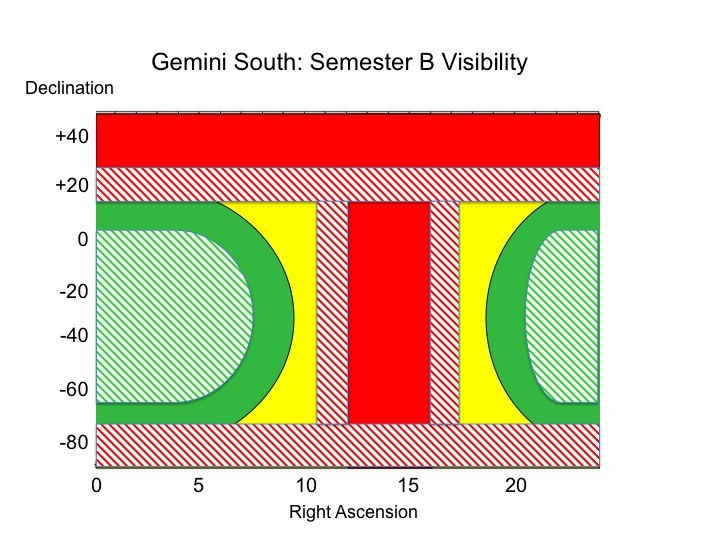 Figure 2: Schematic representation of target accessibility at Gemini South during semester 2016B. Green regions offer unrestricted access, red regions are inaccessible. Hatched areas indicate the more restricted GeMS regions. The yellow region is possible, but restricted. See text, and values in the Gemini South Table above.